SNES Mega Man & Bass (JPN) "100 CDs" in 38:07.68 by sparky, parrot14green & woabclf. Rockman & Forte (ロックマン&フォルテ), known as Mega Man & Bass in the western world, used to be the last game in the original Rockman/Mega Man series, until Rockman & Forte Mirai kara no Chōsensha (ロックマン&フォルテ 未来からの挑戦者) was released for the WonderSwan. This time around, Dr. Wily has his own creation turned against him, allowing the player to use Mega Man or a bad guy! 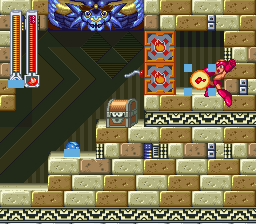 However, in this run, the players only use Mega Man and collect each and every CD in the game, which shouldn't be possible using only one character. Then again, many things happen in this movie that weren't intended to be possible. This run is a collaboration between sparky, the current author of the other branches for this game, parrot14green, the author of the previous "100 CDs" run, and woabcfl, the author of the Rockman no Constancy runs. It improves the previous movie by 1:40.96. You can read the authors' comments for more details. There are two more Rockman & Forte runs to watch on this site; featuring completion of the game with Rockman and Forte as fast as possible, without worrying about CD collection.